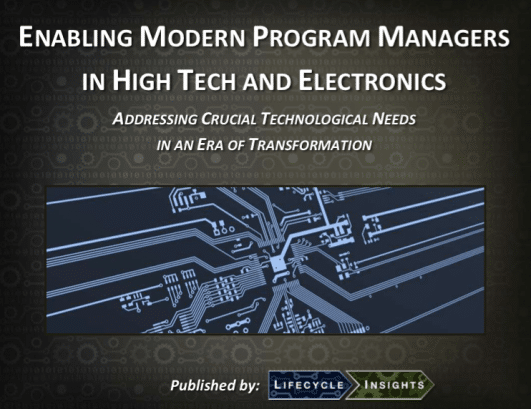 This eBook focuses on the trends that are changing program management in high tech and electronics and their resulting technology needs. In an industry known for breakneck change, change is afoot again. But in this case, the changes aren’t just to the technologies. The impact of investment decisions are more dire than ever. Supply chains are transforming as more responsibility is passed down. Products are transforming into experiences. Program Managers are faced with leading such changes, but need certain technology capabilities to be successful. This eBook details the trends in the industry as well as the resulting technological needs of Program Managers. This eBook is of most value to Program Managers in companies serving the High Tech and Electronic industry. It is particularly useful for those that are striving to lead their companies into a more disciplined practices in the face of evolving supply bases and the transformation of products into experiences. In the High Tech and Electronics Industry, the consequences of failure are dire. Make no mistake: The failure of a product can be devastating. It mars the brand and company, leaving a negative impression in the minds of consumers for years. But beyond the impact of a bad product on top line revenues, the effect is felt on the bottom line as well. The investment to bring such products to market is huge. Despite all of these well-known realities, companies are lucky if 3 in 10 products are successful. In the context of such dire consequences, serious change is underway in the High Tech and Electronics industry. To ensure they are making the right development investment decisions, some manufacturers are adopting more disciplined and structured portfolio management processes, eschewing gut-feel and technology-led decision making. Furthermore, some are also seizing on the opportunity to transform products into experiences, made up of combinations of hardware, software and services, for differentiation. Lastly, with a greater need for broader expertise to develop these experiences, more are incorporating suppliers as valuable partners in the development process. This, of course, carries big implications for Program Managers. Portfolio processes need up to date and accurate information; otherwise, decisions are made based on the wrong data. The transformation of products into experiences demands more collaboration early and throughout development. Incorporating suppliers as valuable partners requires closer collaboration. Ultimately, all of these issues directly affect how Program Managers do their jobs, day in and day out.